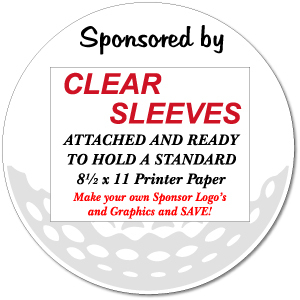 18 Hole Kit - 18" Round Coroplast® Golf Sponsor Signs with Clear Plastic Sleeves and Display Stakes. These signs are great for last minute sponsor arrivals! Take new sponsorship right up to tournament day! We recently needed hole sponsor signs for our Project Grad golf tournament. While I had researched prices online, I also dropped the ball in ordering. SignMart had the best prices and a great design that will allow us to reuse these signs year after year. Best part, their shipping was quick. We had the signs within 2 days! Great customer service (called to confirm that I would have the signs delivered before I needed them), product is durable and well made, and shipping was fast! Highly recommend these particular signs and this company! Just received these reusable signs yesterday. Was very impressed with the overall quality and low price. We are hoping these signs will last for years to come at our high school fundraiser golf outing. Thanks so much SignMart! Q: Product# GSS900 18 Hole Kit How do the stakes attach to the signs? A: The wire stakes slide up into the flutes of the coroplast sign at the bottom of the sign. Q: What size is the sleeve that I can slide my sponsor names in to? Q: Will this item be back in stock soon? A: They are now back in stock.